Field roads and furrows are some of the most vulnerable areas on sloping farmlands for winter erosion. Seeding non-weedy grass or other winter annuals on roads and on pre-bedded fields provides a large root mass that reduces the rate and volume of runoff. This protects roads from washing out, protects bed ends from slumping, inhibits the growth of weeds, boosts infiltration, and enhances the water quality of runoff into adjacent streams. 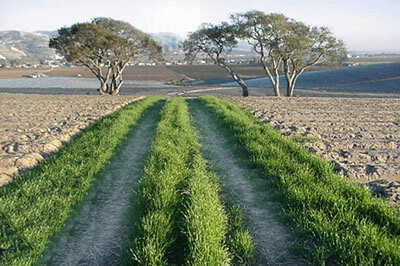 A winter cover crop can also trap nutrients in the root zone to prevent soil nutrient loss from leaching during winter rains. Road seeding is useful on sloped farmlands with roads running directly downslope between planting blocks that that capture and transport winter runoff downslope. Furrow cover crops can further reduce the runoff delivered to the field roads and ditches that they drain to, reducing erosion risk both within furrows and downslope from the row ends.